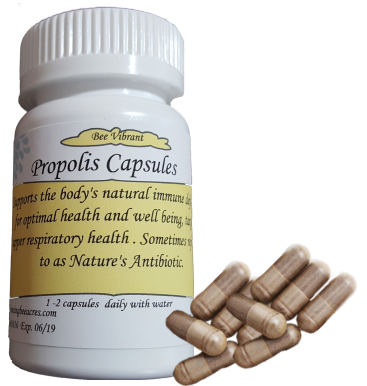 Our propolis capsules are an easy, convenient way to secure the benefits of propolis on a daily basis. Propolis capsules, 500 mg. No fillers no synthetics. Stimulates the immune system and acts as an anti-fungal, anti-viral, and all natural anti-biotic.60 capsules per bottle. my energy is strong calm and clear thanks to this product. I have total faith in Dancing Bee Acres product quality.